Rory Cellan-Jones reports on the winners and losers at the video game Baftas, where Super Mario Galaxy won the prized Best Game category. Remember to refresh this page regularly to keep up with the latest updates. 2233 The BBC's Daniel Emery writes: So, the closing speeches, the applause The Bafta awards are coming to an end. To be honest, it was a bit disappointing. Despite seven nominations, Rockstar North - developers of GTA IV - come away empty handed. Media Molecule - developers of LittleBigPlanet - got a single gong and no one title swept the board. The Best Game award - Super Mario Galaxy - took everyone by surprise. One gets the feeling that a public vote would have produced some very different results. From The Hilton on Park Lane in Central London, good night and we hoped you enjoyed the coverage. We'll be doing it all again next year. 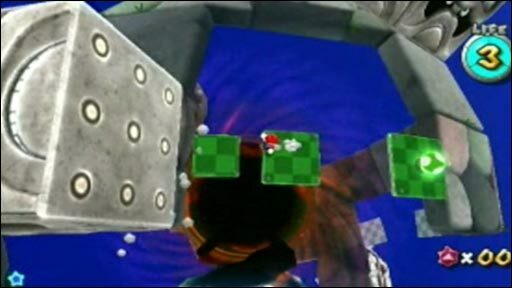 The BBC's Daniel Whitworth writes: So no-one was expecting it but Super Mario Galaxy won. Rob Lowe - who picked up the award on behalf of the game - seemed really pleased with the win and defensive against claims it's not a "gamer's game". And that just about wraps it up for the evening. It's been a rollercoaster ride of interviews, note taking, red carpet watching and of course, like Rory said, sandwich eating but great fun overall. now back to the office to sort it all out for Radio1 news bulletins in the morning. ...so a night of surprises. 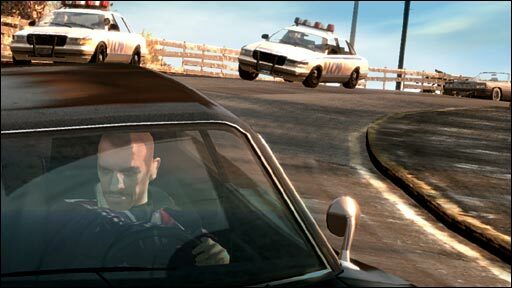 Not a single Bafta for the biggest game of 2008 GTA 4 - which had huge sales and great reviews. A few British successes - just one Bafta each for Media Molecule(LittleBigPlanet) and one for Codemasters. bskipper27 tweets: Super Mario Galaxy wins Best Game at the Baftas. Justice for gamers everywhere as it's truly one of the best games ever made. Kudos Bafta! 2220 Jonathan Ross is presenting the final award for the night - the Bafta Fellowship to industry legend Nolan Bushnell. 2216 The BBC's Daniel Emery writes: I'm gobsmacked. One of the biggest selling games of all time, GTA IV, revolutionary in so many ways, has failed to pick up a single industry award. The BBC's Daniel Whitworth writes: Wow. Everyone in the press room is gobsmacked. Super Mario Galaxy has won best game. Wow again. No-one here was expecting that. 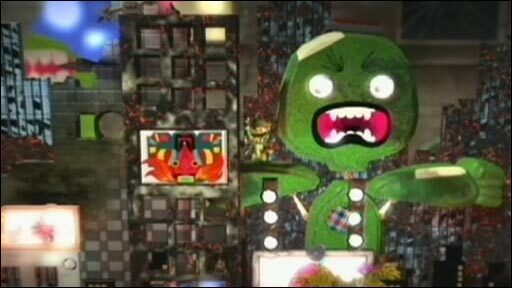 The BBC's Daniel Emery writes: LittleBig Planet wins at last - for artistic achievement. Most of the 30-strong Media Molecule team have travelled up from Guildford for tonight's event - and they let rip with a tremendous roar. Great to see a tiny business which didn't exist three years ago get this recognition. 2206 Another technical Bafta, this time for Artistic Achievement. Finally a gong for the guys in Guilford, LittleBigPlanet gets its first Bafta of the night. The_B tweets: Professor Layton wins Handheld BAFTA. Shocked me, I was sure Zelda would have ran away with this, but I've heard good things about PL. 2204 Bafta for best Handheld goes to Professor Layton and the Curious Village. 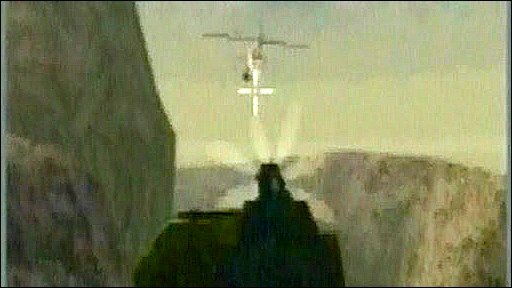 2201 The BBC's Daniel Whitworth writes: So Call of Duty 4 just got ANOTHER award. It looks like it might be the game's lucky night. Now I really need to make sure I interview them when they come back through to the press room. But each time they win an award, when they're supposed to come through, they have to go and sit back down because they're nominated (and going to win?) so many. 2200 The BBC's Daniel Emery writes: It's Ten O Clock and we're coming up to the important awards. But so far, disappointment for British developers, with GTA IV and LittleBigPlanet so far failing to pick up a single award. 2159 People's Choice Award goes to Call of Duty 4 And that means CoD 4 takes the lead again. It looks like it might turn out to be the Slumdog of the Baftas. johnnyminkley tweets: Dead Space wins another BAFTA. One hopes there's an attendant Brits Awards-style sales spike. Great game. 2154 The next award - The People's Choice - isn't actually a Bafta. But it's the only award of the evening that was voted for by the public, rather than by a closed panel of judges. 2153 - Bafta for Original Score goes to Dead SpaceThat's the second one for Dead Space putting it level with CoD4. Nothing yet for GTA IV. The BBC's Rory Cellan-Jones writes: The guys from Codemasters join me with their BAFTAs - very proud that Britain's last independent publisher/developer has won against the might of Nintendo in the sports category. 2147 The BBC's Daniel Whitworth writes: Wow. Now the interviews are really coming thick and fast. The teams behind Boom Blox, Race Driver: Grid, Civilisation Revolution and Call of Duty 4. Phew. But early indications suggest no-one is really sweeping the board. 2145 Bafta for Best Multiplayer goes to Left 4 Dead. I've played that one and can confirm that it is mighty fine. I hate witches. They always catch me out. 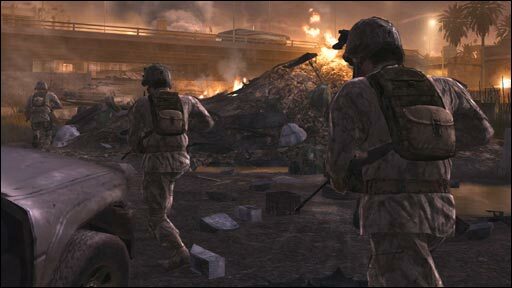 esteluk tweets: COD4 best story + character? Against Fallout 3 and Mass Effect? Get real, BAFTA people. 2137 Barry Cordell from Firaxis games who won the Strategy Bafta says: "I went blank on stage. I'd rehearsed my acceptance speech when I went up it all vanished. But winning was fantastic." Nasim, London, writes: My game of the year has to be Metal Gear Solid 4 Guns Of The Patriots. I couldn't believe it when I heard that this game was not even nominated. Metal gear solid 4 has a great story behind it, beautifully designed in terms of graphics and overall its a great game. A movie adaptation of Metal Gear Solid is soon to be released in 2010. 2128 Alex Zane is up to present the award for best use of audio, Before he starts, he thanks the developers of Mass Effect and says "Boning and Alien chick in mass effect was just brilliant. Thank you." Robin, Herts, writes: The video games industry body TIGA has recently called for more government support for the U.K. games industry. Despite recent successes it is slipping down the world rankings because it is not given the same support that is given to other creative industries such as films. While other media are being hit hard by the recession videogames sales are thriving - its time the government realised how valuable this industry can be to our economy and stopped using games as a scapegoat for childhood obesity and violent crime. 2126 Konnie Huq - who presented the first Bafta says "The night is great. I've been to Silicon Valey and seen all the programmers typing away..."
2124 Gavin Raeburn from Codemasters who won the sports Bafta says: "I'm utterly staggered, we didn't see it coming. It's mind blowing. The BBC's Rory Cellan-Jones writes: Call of Duty developer Robert Bowling comes to the press room, he leapt on a plane from LA to be here - says the game was aimed at wide public and is glad that it's succeeded in reaching so many. It's the first of seven awards COD is up for...how many more will it get? 2112 The Sports award goes to Race Driver: Grid. Rack up one for the Brits. Codemasters are behind it and are based in Warwickshire. Paul, Southampton, writes: I'm not best pleased with gaming companies at the moment since many of these recent released games require online activation, a windows live or steam account which has caused horrendous problems for honest gamers who don't, and never have, pirated games. Some people still don't have internet access for one and others only have a limited amount of time they can actually be online. Add of course the fact that many games are rushed through production and are therefore unfinished or buggy and that gaming companys are starting to edge towards buying online only you can see why many consumers are loosing their patience. 2112 The Casual award goes to Boom Blox - the game developed with the help of movie maven Steven Spielberg. byronicman tweets: Peter Molyneux's not joking about his trousers falling down at tonight's Bafta games awards. Or maybe he was just pleased to see me! 2110 The Gameplay award, the first of the night, goes to Call of Duty 4.
seniath tweets: Chances of a PC-exclusive winning a BAFTA tonight? Not likely, eh. Though, I guess E:TW topped the multiformats, so you never know. Alex, Birmingham, writes: This year we've seen downloadable games come to the forefront, with many surpassing full price high street games in terms of concept and quality. Flower, a game where you control a petal on the wind, noby noby boy which is beyond words, and linger in shadows, a surreal interactive art experience involving oversized flying cats and dogs, are but a few that come mind that should be awarded for their ingenuity alone. 2059 The BBC's Rory Cellan-Jones writes: Dara O'Briain begins his routine by telling us: "This is possibly the most popular entertainment industry in the world - but doesn't get the recognition it deserves." johnnyminkley tweets: Chairman of BAFTA talking about Tweeting the Awards. Universe about to implode. Baftaonline tweets: Just popped out to the loo and there's a lot of nerves out in the foyer... people really want to win, but don't want to admit they do..
2052 The BBC's Daniel Emery writes: Finally! The ceremony is about to begin. About time too. Who will be the Benjamin Button? Who the Slumdog? Given that some titles, such as Call of Duty and GTA IV, are up for lots of awards it is likely that someone will go home disappointed tonight. Craig, Queensferry, writes: As a keen gamer myself, this event holds much interest for me. However, I do hope it will not fall into a row over how video games are corrupting the minds of children into committing crimes. Video games are a fun pastime, which, in the right circumstances, can educate and exercise our minds and bodies. On a more personal note, I hope GTA 4 wins a few awards; it is good to see a Scottish game company beat the competition, for once. psholmes tweets: Why arnt the BAFTA Video game awards being shown on TV ????? James, Canada, writes: The last year has been horrible for gaming. Every new release just consists of bigger numbers on old worn out titles, with very little in terms of originality. So my verdict is there WAS no "Game of the Year", all mainstream games this last year sucked, and next year will most likely be the same garbage. Welcome to Consumerism. Triff tweets: Waiting on the BAFTA games results to start rolling in. Wii Fit will almost certainly beat us tho... Hrrn. 2028 The BBC's Daniel Emery writes: The guests are on the coffee...not long now. Adam, Southampton, writes: Cinema is an art form, so why not games? Why must we look down on a format that as much effort goes into its creation as the latest Hollywood release. Tragically, since it will always be associated with 'low culture' - a term I frankly find disgraceful. High and low culture is a myth - it is all the output of humanity's creative potential. 2025 The BBC's Rory Cellan-Jones writes: The sandwiches have arrived in the press room at the Hilton. Wow, those games bloggers are a hungry lot. Ben_S_Hailey tweets: is hoping that Metal Gear Solid 4 wins a Bafta tonight, but it should have been nominated for Game Of The Year! The BBC's Daniel Whitworth writes: Ok, so waiting around for celebs and nominees to arrive on the red carpet outside is COLD. Seems like most of the big names have now arrived - Jonathan Ross, Ralf Little (Royle Family), Kirsty Gallacher (TV presenter) and TV Bafta award winner Noel Clarke. So, back up to the press room to try and get warm again where there's now a crowd of journalists setting up to report on the ceremony. We're all being kept very separate from the awards itself, but on the big screen TV they've set up for us to watch the event as it unfolds it looks like most people are taking their seats and getting started on the drinks. Jonathan Ross: - "I've no idea who is going to win"
David Wilson - Head of PR at Sony: "I've just met Nolan Bushnell. The man is a living legend." Kieran, Northampton, says: The last 12 months in the computer games industry has seen little to no improvments in the fields that really matter, gameplay and story telling. The public seems perfectly happy to buy remake after remake for their console, let games get back to where they should be, on your computer. Peter Molyneux - veteran game maker: "I wasn't sure why I was nervous but now I've got here I realise why. And what's worse my trousers are falling down." 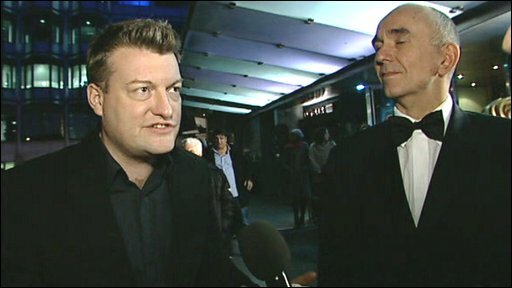 Charlie Brooker - media pundit and gamer: "I think GTA is going to do well. I would like to see LittleBigPlanet get some awards and CoD 4 was bling." James Binns - publishing director at game mag firm Future : "Bafta know how to put on a good party." Rhianna Pratchett - Narrative paramedic: "I think LittleBigPlanet will get a few gongs and GTA IV might also do well. Steve Boxer - veteran game journalist: "GTA IV should do well and I want to see LBP scoop some awards." Adam Rosser - presenter of 5 Live Game On: "Call of Duty 4 should do well. Otherwise it's an even field." 1903 The BBC's Rory Cellan-Jones writes: Just met Ian Livingstone of Lara Croft fame and asked for a tip. He smiled and remained tight-lipped - turns out that he is one of the judges. 1752 The BBC's Daniel Whitworth writes: 8 minutes until the red carpet arrivals are due to officially start arriving. just time for a last little hoover by one of the cleaners. quite a few photographers and press people are all being kept at bay by a couple of security barriers. just waiting for the nominees and guest presenters to arrive. Al, Aberdeen, says:The last 12 months have been among the best we've had in gaming for a while - we've had some genuinely epic titles which lived up to the hype which preceded their release. 1723 The BBC's Daniel Whitworth writes: Just arrived and managed to file a preview report for Radio1 Newsbeat at 5.45pm so the rush is over! Getting a bit of time to check the place out though and the nominees are in for a very posh do. The tables are being laid and the drinks put on ice in the hotel's Grand Ballroom where the ceremony is taking place. And I've just spotted the host Dara O'Briain arriving and looking, it has to be said, a little pre-occupied - nerves perhaps? RenZephyr tweets: Lot's of out of place looking people million around at the Hilton, assume these are games industry folk. Wossy tweets: A nice person from Bafta has "requested" I do not dress as Parappa the Rapper for the Video Game Awards tonight. Fail. The awards ceremony is due to kick off at 2030. However, the tension has been building all day as those nominated get ready to attend the gaming industry's big night. Hello and welcome to our live text coverage of the 2009 Bafta Video Game Awards. We will be bringing you up-to-the minute coverage of the games industry's biggest night of the year from our reporters at the ceremony in London. 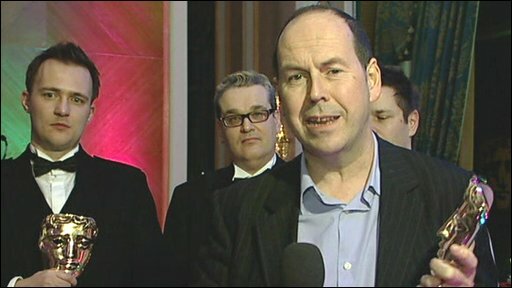 Attending the event at the Hilton in London for BBC News are technology correspondent Rory Cellan-Jones, technology reporter Daniel Emery and Radio 1 Newsbeat technology reporter Daniel Whitworth. In all, 39 games are up for an award in 15 separate categories. Call of Duty 4 and GTA IV top the rankings of most nominated games. But others, such as LittleBigPlanet, have proved popular with the judges too.